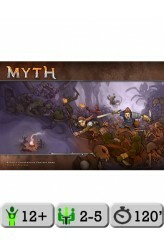 Myth is a fully co-operative fantasy game. Players take on the role of one of 5 different heroes working together to defeat the Darkness. Each hero has a different skill set which represented by a unique deck of cards. Players spend Action Points by using cards. Once a certain amount of Action Points have been spent the Darkness fights back by activating monster lairs, spawning monster captains and eventually the Boss. A complete game in Myth is called a Story. Each Story is played over three Acts. Acts can be played sequentially, or can be split up over three different game sessions. Players' avatars within a Story are called Heroes. Myth Heroes are clothed in immense power, able to reave all but the mightiest foes. However, this power must be balanced lest the Darkness take to..